As one of the leading manufacturers in the industry, Birmingham Fastener Manufacturing puts a premium on quality and productivity with continual improvement. 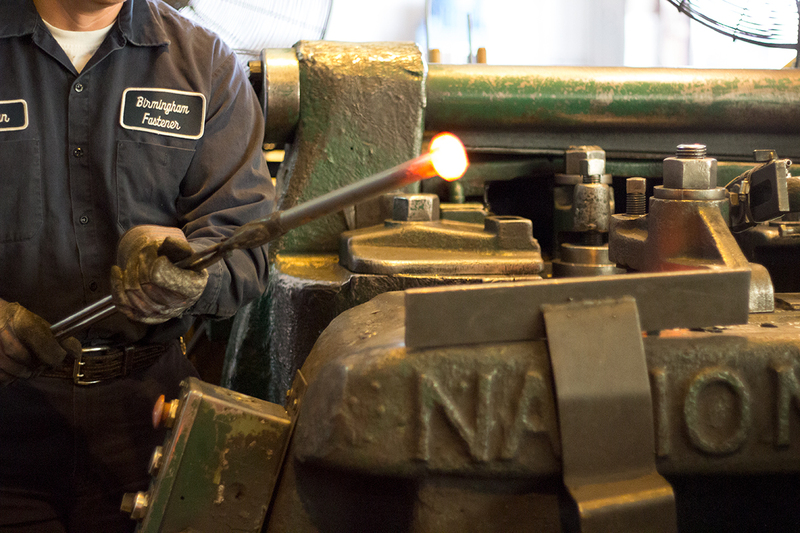 Our 300,000+ square foot facility produces thousands of fasteners each day. Our operators work safely and efficiently to make products that meet and exceed all industry requirements. We take immense pride in our manufacturing facility being ISO 9001-2015 certified. Quality begins with consistency and accountability. Our experienced team inspects our products to ensure they are up to our standards. Our daily in-house testing includes rotational capacity tests, tensile strength tests, dimensional analyses, and more. Birmingham Fastener Manufacturing is able to provide your company with extraordinary custom work. Our engineers can produce fasteners from your specific drawings made to order, providing expert knowledge on the subject. Tooling can be created to produce nonstandard head dimensions, and our special fastener work includes manufacturing special thread lengths and head configurations, chamfering, custom bends, various coatings, and more. Contact us today to discuss your next project.